Join our AnnaPurna Pantry “pay it forward movement” and help share Artisan grown, local produce with a wider community by investing in a suspended share of harvest. The seeds of AnnaPurna Pantry came from inspiration gained in a remote place in India and the practices of Yoga Ecology and Bhakti Yoga. The practices encompass the visions of Serve, Love, Give and Feed People, Love People. In Indian mythology, Ma AnnaPurna is honored as the “Giver of Nourishment” and food is shared freely and equally with surrounding communities, residents and guests. The seeds from that inspired vision were carried to North Shore Oahu and planted. The stories of Ma AnnaPurna allow us to learn about the boons of unconditional giving and show that our innate nature is to give. Anna means “food” in Sanskrit (an ancient Indic language of India) and Purna means “filled completely”. The form of Annapurna is represented as the Mother of farms, kitchens/cooks and nourishment. As the story goes, Annapurna not only bestows of food at the physical level, but is also the fulfiller of those items we need to consume for the health of our emotions, mind and spirit. In India it is believed that when food is grown and cooked with the awareness of the sacred and the intention of sharing, it becomes alchemy and nourishes our physical bodies and our souls. Our Suspended Harvest Share Initiative is modeled after the suspended coffee movement. This Movement was derived from an old 20th century tradition from Italy. When customers bought coffee, they’d also pay in advance for a cup to be given to somebody else that day not as an act of charity but as a simple act of sharing. This “pay it forward” movement has inspired people to expand it into other areas. 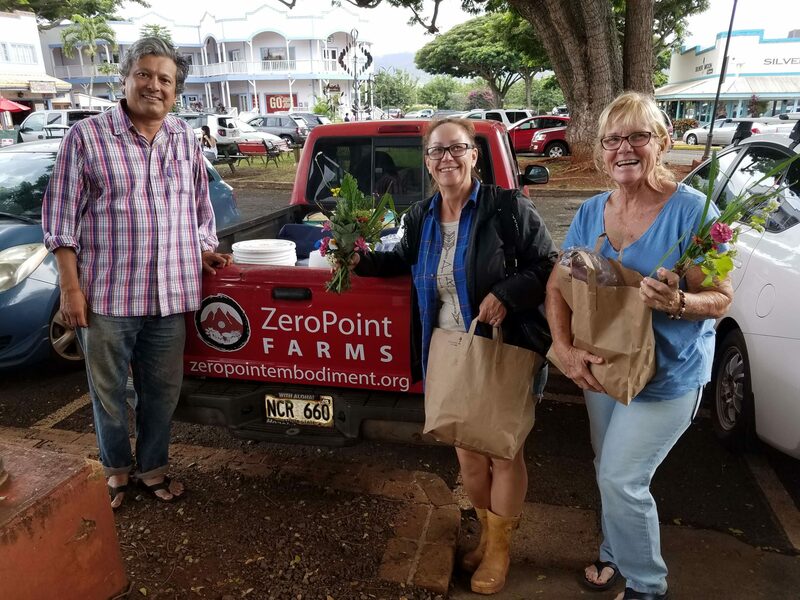 At ZeroPoint Farms, we were inspired to share our Artisan Produce through suspended harvest shares to make it more available throughout the entire community. Give to Someone in Our Community! We’d be delighted if you would sponsor an AnnaPurna Pantry suspended share. This will provide a share of harvest for a community family from April, 2019 for 10 weeks. By being a sponsor, you’ll be joining a vibrant movement to make artisan grown farm fresh food available to everyone. Know someone in need? Nominate a community member to receive a suspended share. Give a member of the community a weekly share of seasonal vegetables. Cash: Cash Payment: We will contact you to organise payment. Nominate a community member to receive a weekly share of seasonal vegetables for the 2018 Growing Season. Nominate yourself or a community member for a suspended share funded by the community.